Are you using Windows 10 but choose Chrome over Edge for your internet browsing? Well, you should know about the extension Office Online. Created by Microsoft themselves, Office Online provides you instant access to your Office document on Chrome, in just one click! 1) Install the extension from here. 4) Click on the Office Online icon from the extension bar and connect to your Office account. 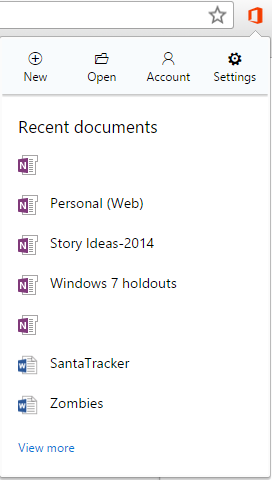 From now on, when you click that icon, you’ll be presented with your most recent documents on Word, Excel, PowerPoint, etc. With Office Online, you can instantly drag files into the browser and save them onto your OneDrive. It’s a great time-saving platform!